noeatnosleep · 1766 days ago · link · · parent · post: Give me some "SPAM"
Yes, it could, but it would be big and expensive. It's 3d printed and you pay by the cubic centimeter. I make a pentagram (the Pythagorean kind, not the mystical pentacle) made from 5 men that I think is pretty sweet -- I wear one myself everyday. Check out Naked Geometry for that one. Could you explain the difference to me? A pentagram is a five pointed star with crossing lines, the kind every kids learns to draw. A pentacle is a pentagram inside of a circle and has a rich history, which includes usages in various kinds of "magick". 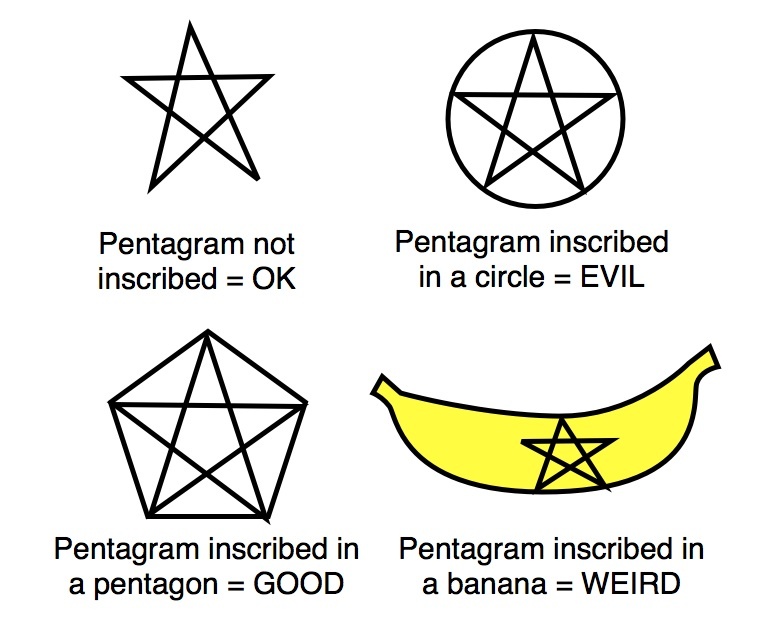 A pentagram inscribed in a pentagon is the symbol of the Pythagoreans and is a kickass mathematical shape. Donald Duck and math, it is wonderful. If you mean about the Pythagoreans, they were a weird cult but most of the magicey stuff attributed to them was the nuttier Neoplatonists like Iamblicus claiming an ancient source for their own ideas to give them authority. There isn't much to go on about the actual Pythagoreans, and most of it was written by people who didn't like them. They might have been a lot like the early Academy, given Plato's interest in them. I'm not a classicist, though. Mostly I think Donald Duck movies about geometry are pretty great. You realize Pythagoras was an occultist, started the first secret society, and is considered the father of Freemasonry and Rosicrucianism, the grand-master of double-meanings and hidden teachings, right?